It’s not a big stretch for me to make Chocolate Peppermint Patties. It is a HUMONGOUS stretch for me to make them without butter. Not too long ago I received an email from Jill Browning PR about a client of hers, Elizabeth Nyland. Elizabeth was just releasing her first cookbook, cooking with COCONUT OIL and wanted to know if I would be interested in reviewing the book for Desserts Required. I was very upfront with Jill. I told her that I had never cooked with coconut oil but that I was willing to take a look at the cookbook and go from there. Jill assured me that the book had many dessert options, Chocolate Peppermint Patties being one of them. I am a big advocate of encouraging and supporting other bloggers, but had to make sure that there were recipes that were appealing not only to me, but to you as well. cooking with COCONUT OIL is filled with gluten-free, grain-free recipes….totally outside my comfort zone. Then again, comfort zones need to be challenged here and there and I am not one to back away from something like Chocolate Peppermint Patties. I bought new (to me) ingredients – coconut butter, coconut oil and coconut milk. I did not want to make just the Chocolate Peppermint Patties. I, also, wanted to try other recipes in the book so I bought almond flour and coconut flour. For the Chocolate Peppermint Patties I used pure peppermint oil instead of fresh mint leaves. The recipe was easy enough to follow. I think the only part that was not clear to me was where to cool the peppermint patty filling – refrigerator or counter. I opted for the fridge and my mixture did separate, which Elizabeth said might happen. I mashed the mixture back together and then scooped it onto a parchment lined baking pan. After freezing the filling for the peppermint patties, I dipped them into melted dark chocolate. I was not able to find the 90-100% dark chocolate that the recipe calls for, so I used 86%. I found that I needed to nearly double the chocolate listed in the recipe. I switched to 60% chocolate because I ran out of the 86% and that was what I had in the house. I made two other recipes from the book, Dark Chocolate Brownies and Chocolate, Fruit and Nut Energy Bars. Both recipes took me wayyyyy outside that comfort zone I referred to because they both called for nut butter and medjool dates in addition to almond flour and coconut flour. I am not sure if I did something wrong with the brownies because my ‘wet’ ingredients were not really wet and my brownies were a tad dry. The energy bars were delicious! I may be inclined to cut back the coconut oil just a speck, but otherwise, I would not change a single thing. I was really proud of myself for stepping so far out of my comfort zone. I learned a bit about new ingredients, at least ‘new’ to me. Compared to the more traditional ingredients I usually buy, these new ingredients were relatively expensive. I think if you are inclined to use coconut oil on a somewhat regular basis, this is the perfect book for you. For those of us who may not be so inclined, I still think it is a good book to add to your cookbook collection and use when you are ready to try something new. It is very informative and easy to follow. Start with the Chocolate Peppermint Patties! They are delicious. Disclaimer: I received a review copy of cooking with COCONUT OIL. All opinions are my own. Melt the coconut oil with the peppermint oil over low heat. Transfer to a bowl and whisk in the coconut milk. In a separate bowl, stir the coconut butter, honey and vanilla together in a small bowl. Add this to the bowl with the coconut oil. Refrigerate for 1 – 2 hours. If the mixture separates, mash it until it is smooth again. This may have to wait until the mixture is at room temperature. Line a baking sheet with parchment paper. Once the filling is at room temperature, scoop out small balls and shape them into patties. Place the patties onto the baking sheet. Freeze until hard, at least 20 minutes. In the meantime, melt the chocolate either in a double boiler or in a metal bowl set over a saucepan of simmering water. Cool for 5 minutes. Working quickly, dip each of the peppermint patties into the chocolate and place back onto the baking sheet. Place in the refrigerator to set. Store in the refrigerator for up to 7 days, if they last that long. ½ teaspoon pure peppermint extract OR ½ cup fresh mint leaves may be used instead of the peppermint oil. If using the mint leaves, place them into the saucepan when melting the coconut oil. Once the coconut oil melts, allow the leaves to sit in the pan for 15 minutes. Strain the leaves and continue with the recipe. Elizabeth recommends using 90% to 100% dark chocolate. I was not able to find that so I used 86% dark chocolate, until I ran out. Then I switched to 60% chocolate. If you prefer semisweet chocolate, by all means, use that. Additional time is needed to refrigerate and freeze the patties. Yum! This looks divine! Love your tidbits too..very thorough and informative! Thank you, Betsy for sharing! And I guess it’s been awhile since I last visited..love the new look ;). Thanks so much. I greatly appreciate the feedback and thanks for noticing the new and improved Desserts Required! Oooo, I love coconut baking things, but what is coconut butter? How is it different from coconut oil? I am so glad you asked these questions. Thanks to cooking with COCONUT OIL, I know what coconut butter is. Ok, actually Elizabeth Nyland has the answer and I will pass along her information! Coconut butter is the dried whole flesh of the coconut that has been pureed into a dense, smooth spread. It is also called coconut manna, coocnut spread, coconut concentrate and creamed coconut. Coconut oil is oil that is taken from the flesh of the coconut. So much yum, wish I had a bunch right now! I can’t tell you how excited I am to try these. My dd has food allergies and she can have ALL the ingredients in these! Thank you!!!! WOOHOO!!! I love reading this. Please let me know how your dd likes them! I hope you saved a few for me, Betsy 😉 Being a blogger gives us all sorts of opportunities to cook outside our comfort zone…glad you were successful with these yummy candies! I will even make you a FRESH batch! I make more traditional Peppermint Patties. Now I need to try these just to see if I like them better. Thanks for adding your tips, that helps a lot. 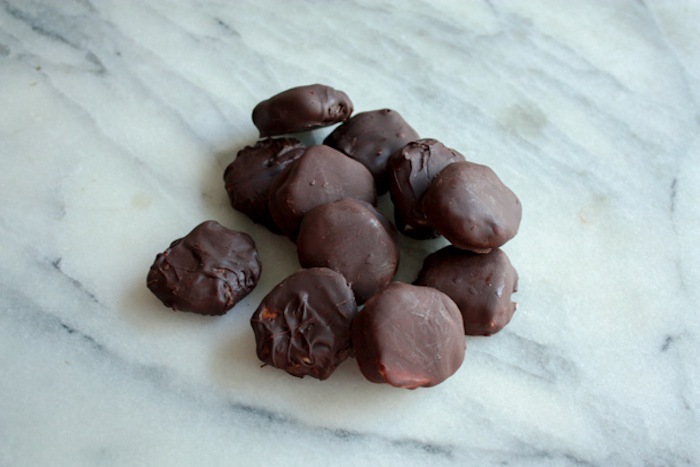 I have always made the more traditional Peppermint Patties as well. It was fun to try something different and they are really good! Let me know what you think once you make them….you know, in between texts, calls, tweets and everything else your cellphone tells you to answer! Loved your recent post!! Thanks for dropping in on my blog. Yours is great! My pleasure. I love finding blogs that are new to me! Thank you for stopping by Desserts Required!